"It's a mysterious, terrifying and fascinating world. The world of computer games. Alone, you will perish. Top Secret lends you a hand." 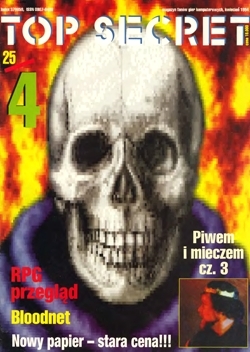 A Polish video game magazine which evolved from earlier computer magazine "Bajtek" and existed from 1990 to 1996. Top Secret was the first magazine of its kind in Poland, and quickly became a cult classic still fondly remembered today, mainly because of its editors' wacky sense of humor. It was characterized by huge amounts of inside jokes (sometimes the articles would descend into ranting about the editors' everyday life). The editors had huge freedom which would be unthinkable today (which might have been one of its causes of death; advertisers simply shied away from such a non-serious magazine). In the beginning, Top Secret wasn't really a review mag - until 1994, due to the obsolete copyright law, software piracy was basically legal, so pirates were pretty much the sole source of games - and since they sold games at cheap prices, buying a bad game wasn't much of a loss. Thus, an average gamer needed a manual and a gameplay description more than a review (especially since knowledge of English was very scarce). Later on, the mag began actually rating the games, much to some readers' ire who claimed that reviews are for "snobbish magazines". Occasionally, the magazine contained comics featuring its three Mascot characters; the comics were basically Sprite Comics, with the characters digitally added to the screenshots. Big, Thin, Short Trio: Kopalny, Naczelny and Dżemik, respectively. But You Were There, and You, and You: Piwem i Mieczem ("With Beer And Sword"), an episodic story, involves a character hallucinating about going to a fantasy world and meeting characters who are all based on the magazine's editors. Computer Wars: Most of the reader letters are Atari vs. Commodore 64 vs. PC vs. Amiga. One particular reader (Krzysztof Kubeczko) became more or less a legend due to his hilariously vitriolic letters about the superiority of the 8-bit Atari (and his later tragic death). Digital Piracy Is Evil: In one of the comics, the characters go to the future and find out that the entire gaming industry collapsed long ago due to software piracy. They promptly set out to Set Right What Once Went Wrong and cause new copyright laws to pass. Four Point Scale: The majority of games received scores between 80% and 100% of maximum. There are times when the review is clearly written in a negative note, yet the score is still a high one. Benevolent Boss: Naczelny, the editor-in-chief, who is basically the real editor-in-chief's Author Avatar. The Alcoholic / The Ditz: Kopalny. Note From Ed: Indulged in it a few times. The most major example comes from issue 28, where the editor-in-chief butts in (supposedly to remove the reviewer's unrelated ramblings) and instead writes half of the review himself. Only Known by Their Nickname: Except for the masthead, the editors all signed themselves with, and referred to each other with nicknames. Reboot: In 2002, the title was restarted by Axel Springer publishing house, with the best-known "original" editor-in-chief at the helm. It lasted for four issues. The Rival: Secret Service, a rival magazine (helmed by Top Secret's former editor-in-chief and managing editor who left in 1992 to pursue their own career.) Since then, both magazines kept tossing thinly veiled Take Thats at each other. Rouge Angles of Satin: Whenever the English language is involved, both on part of the readers and the editors. Serious Business: For the readers, the Computer Wars above. Also, in the earliest issues (1990-1992), playing computer games is sometimes treated as something of a mystic ritual. Sprite Comic/Machinomics: As mentioned in the description, there were quite a few comics, most of them made up of game screenshots with the characters (standing out, as they were drawn in vector graphics) added in. Trademark Favorite Food: Sir Haszak, the strategy game reviewer, loves pizza.